Why & How to Execute Exchange Offline Database Repair? Summary: The topic is oriented towards consequences & issues with Offline or dismounted Exchange (2010, 2007 & 2003) database. In this regard, how an Exchange Offline Database repair application will facilitate access to inaccessible corrupted emails, contacts, shared calendars or notes etc? What is Offline Exchange Database and what are Major Issues with it? 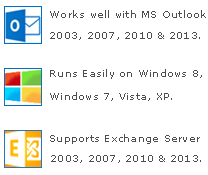 If Exchange server unexpectedly crashes or forced shutdown for updating then Exchange database is dismounted. It is considered as Offline EDB or Orphaned (Exchange database). Consequences with Dismounted or Offline Database: The Exchange server components stored inside this database are in inactive state which cannot be retrieved. Sometimes database fragments are even lost or damaged which mandates administrators to run Exchange 2010 Offline Database repair procedures. Download to repair Exchange database in Offline Mode especially when server is unavailable (read all features). What is the Requisite to Repair Offline Exchange? In offline or disabled state, the chances of corruption are higher which consequently inhibits users to access their mailbox components. As a response Exchange Admin or Users requires to recover mailbox from .edb file. After mailbox recovery, export data from EDB file to Outlook. In orphaned or offline mode, Powershell script needs to run a long-tail series of commands to extract entire data in function format from Exchange 2010, 2003 & 2007 database. For a novice user it can be a intricate job which is not successful every time. Then at this point of time exchange offline database repair tool comes into action for regaining access to Orphaned EDB mailbox components including: emails, scheduled calendars, saved contacts, journals, notes, events etc by supporting 2010 edition, 2003 and 2007 edition. Freeware software allows conversion of 15 emails per user mailbox, rather invest over full version to get full access to database. Pay $299 for full edition.